MANILA, Philippines – Several lawmakers are urging again the government to increase the pay of teachers and all state employees. ACT Teachers Reps. Antonio Tinio and France Castro pointed out that since the Duterte administration failed to address the rising inflation rate then it's due time for a pay hike. With the inflation rate steady at 6.7% in October, the opposition lawmakers said that teachers are struggling to make ends meet. The Makabayan bloc leaders urged the Congress to prioritize the passing of the House Bills 7211 and 7917 that will increase the entry-level salary of public school teachers to P30,000 and Salary Grade 1 employees to P16,000. Castro also asked fellow lawmakers to look into House Bill 7653, which seeks to repeal the Tax Reform for Acceleration and Inclusion (TRAIN) law. 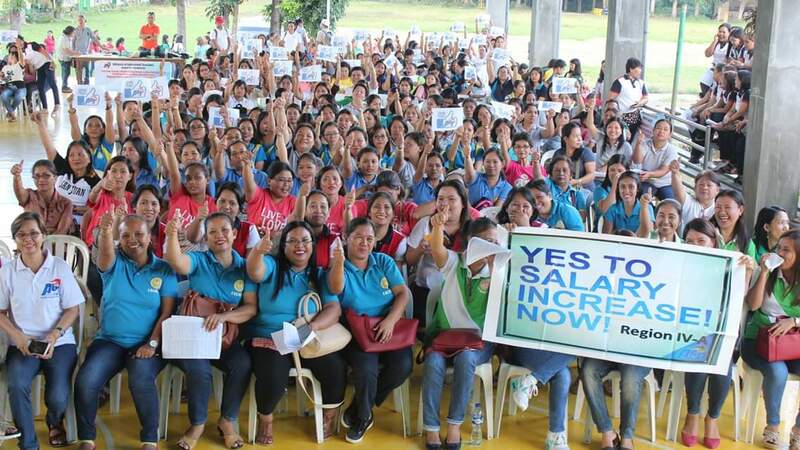 The ACT Teachers representative earlier slammed the “measly” wage hike of P25 granted to NCR workers. They called it “insufficient” with the rising prices of commodities and services. Last October, Education secretary Leonor Briones made an announcement that they couldn't afford a salary for the 6,500 public school teachers in the country.